Every year brings a new crop of health trends, some of which are actually healthful and worthy of adopting; but the majority of which should be made obsolete (remember margarine? — yuck!). With the new year in full force, we think it’s time for some retrospection, and cant wait to share our take on the top 2015 health trends and our predictions on upcoming trends worth following in 2016. Kale – Healthful or Harmful? For a long time, this deep leafy green veg was glorified as a superfood and for good reason too! It’s loaded with nutrients, containing a ton of fibre, iron, calcium, and potassium; plus vitamins A, C, E and K. Recently, however, kale has received some negative press, with reporters revealing that it contains a toxic metal called thallium, which enters your bloodstream when you consume kale. This is worrisome because too much thallium can lead to a slew of health problems including chronic fatigue, heart arrhythmias, gluten sensitivity, skin eruptions and Lyme disease. Before you go swearing off kale though, listen-up. Thallium is found in trace amounts in the earth and many plants are capable of absorbing it, not just kale. In fact, thallium can be found in green beans, watercress, turnip, green cabbage, peas, onions, lettuce, radishes, beetroot and spinach (to name a few). Giving up all of these healthy veggies would mean missing out on a ton of vital nutrients, and it is highly unlikely that you’re consuming anywhere near a dangerous amount of thallium. Our take? Everything is good in moderation! We don’t advice juicing a pound of kale everyday, but consuming a few bunches of it a week, appears to be both safe and beneficial. There’s an exception however. Kale is part of the Brassica family, and when eaten raw it’s goitrogenic (meaning it disrupts the production of thyroid hormones). So if you have hypothyroidism, you will want to eat kale lightly steamed (cooking helps reduce goitrogens), and no more than once or twice per week. In 2015 probiotics were no longer restricted to supplements and yogurts, they turned up in our topical beauty products as well, making appearances in our face washes, creams, serums, masks, and more. Topical probiotics are purported to reduce local inflammation and restore the protective structure on your skins surface, and to also help fight bad bacteria and markedly reduce redness, irritation and skin eruptions. Do they work? While the research is still not strong enough to be definitive, but the reviews online of probiotic products are overwhelmingly positive, and the side-effects nil, so we think this is one trend worthy of incorporation. With rising disposable incomes and an ever increasing interest in all-natural organic foods, gourmet specialty food stores became increasingly popular in 2015, with American consumers spending over 50 billion on specialty foods. While we love the increased interest in foods that are more natural, less processed and locally produced, mainstream grocery stores and large food companies have taken notice of this trend and are starting to develop/offer their own brand of gourmet foods. As gourmet foods become more readily available (and cheaper) at mainstream grocery stores, gourmet specialty food stores may start to lose popularity in the year to come. We sure hope not though! With increasing awareness of the effects of simple carbs on blood sugar levels, and a better understanding of how important balanced blood sugar is to ones energy levels and overall wellbeing, the classic bowl of cereal finally began to lose popularity in 2015. Instead, an increasing amount of people started turning to protein rich breakfast alternatives in order to help stabilize their blood sugar levels. Refined high carb foods were swapped for high protein breads and protein rich drinks and restaurants began to offer more breakfast meals that combine veggies with meats such as pulled pork, brisket, turkey, bacon and chicken. While pulled pork and bacon aren’t the healthiest options, we are huge supported of the protein packed breakfast and predict that this trend will last. For optimal blood sugar, combine your protein with a source of healthy fat and complex carbs, not only at breakfast, but at every meal. Technically cauliflower trended in 2014, when it was touted as ‘the most talked about veggie of the year.’ Cauliflower became popularized because it is low in calories and fat and high in fibre and vitamin C. It is also extremely versatile, making a great dish when crunchy, mashed, roasted, steamed or added to just about anything. As cauliflower became more trendy, the demand grew and supply dwindled. At the same time, the Canadian dollar steadily dropped throughout 2015; these factors combined led to an absurd increase in pricing for the humble veg, with the cost leaping from $2.00 per head to $8.00 in many Canadian supermarkets. Our 2016 prediction for cauliflower? Consumption and popularity will decline, due to unfeasibly high prices, and the availability of cheaper alternatives such as broccoli. 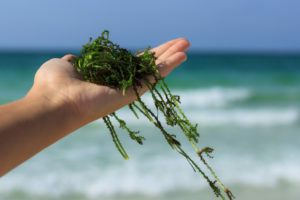 How many servings of sea vegetables do you eat per week? If you answered none, you’re in good company, but sea vegetables (which are being touted as ‘the new kale’) are about to finally gain the attention they deserve. Sea veggies are virtually fat-free and they are an incredibly rich source of minerals that are usually depleted in land vegetables (due to nutrient depleted soils), including potassium, calcium, magnesium, iron, and phosphorus. They are also a potent source of vitamins and enzymes and contain a healthy dose of antioxidant rich-chlorophyll. Chlorophyll helps to cleanse and detoxify the body, increases healing and red blood cell counts and fights inflammation. Sea vegetables are also one of the richest sources of iodine, which helps to promote healthy thyroid function (but should be avoided in those with overactive thyroids). As a bonus, they have a naturally salty flavour, and can therefore help reduce sodium intake, plus they can be grown sustainably without negatively impacting our environment!